The train whistle pierces the morning fog. There is something about train whistles in the American psyche. They evoke feelings of loneliness, memories of faraway places. They have spawned tens if not hundreds of Country/Western songs, but it is folksinger Arlo Guthrie who flashes across my mind when I hear that visceral sound. The elegiac lyrics of his The City Of New Orleans. This train is coming down out of the Iron Range, 161 ore cars loaded with . . . what? Is it taconite? Headed for some harbor on the lakes. And a caboose, a throwback to a time when rails opened the country's true wilderness to explorers and exploiters. The fog has lifted enough for me to count, and though the rails are a quarter mile away and largely out of sight behind the thick growth of pine and alder rising from the bog, the hiss and clatter of steel on steel still feels like a desecration of this small pocket of remaining wilderness, this quasi wilderness. The female on the nest is oblivious. To me, to the train, to everything but the task at hand. Mantling her two nestlings and the breakfast prey delivered by her mate, she is moving her head and upper body up and down, working rhythmically at something beneath her in the bowl of the nest cavity. Periodically she abruptly stops this activity and, in the manner of all owls, swivels her head to peer intently into the forest behind and below her. This is apparently a response to some aural rather than visual stimulus, but the whistle and hiss of the passing train neither captured her attention nor interfered with her reception of these small auditory clues she is so exquisitely evolved to filter and interpret from her environment. Northern Hawk Owl. The species' common name itself evokes a kind of wilderness, a state of wilderness, entirely at odds with that called to mind by the rapidly receding din of the ore freighter. The owl is wilderness untamed and untainted. The owl is the "before." The train is the "after." 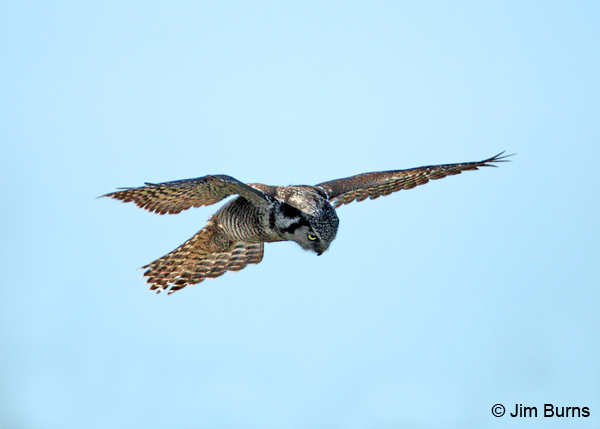 Northern Hawk Owl, even more so than Great Gray or Boreal Owl, conjures visions of the great Boreal Forest, that vast expanse of bog and marsh, water, pine, and sky, stretching to the northernmost limits of our continent. And the memories elicited from deep within our human DNA are all the stronger because that common name includes the word "hawk." Hawk. The hunt and the hunter. If Northern Harrier, with its owlish facial disc, is the evolutionary link on the hawk side between the daystalker and nightwatcher families, then Northern Hawk Owl must be the owls' linkage--the long accipitrine tail, the unowl-like vocalizations, the daylight lifestyle. Other than one Broad-winged, Northern Harrier is the only other daytime raptor I've seen in the fields and marshes interspersed throughout this bogland. Whenever the female's head comes up, the blood on her beak shows as a footnote to the recent, random death of some luckless rodent. Today I am here for breakfast. Yesterday I was here for breakfast and dinner. I am the only vegan in the clearing. There are mice, lemmings, voles, and rats in these bogs, but being no rodent expert, they're all just rodents to me. In the course of observing three mealtimes at the nest, I have witnessed the demise of at least eight rodents and, come to think of it, one was very large and very dark, perhaps a Norway Rat, more commonly known as Brown Rat. As the female goes back to her seemingly very meticulous work in the nest, I have visions of prep cooks in fancy restaurants, working at their cutting boards, slicing and dicing, peeling and sectioning. I have watched this operation in the nest several times now. The female is obviously "preparing" a rodent meal for her brood, now invisible beneath her. I have seen only two nestlings at one time, but there could be more. The birding literature indicates three to thirteen eggs for the species, with an average of seven, but we are at the southern limits of the species' range, so this might well account for a smaller than average brood size. The chef is stripping, tearing, shredding, no doubt apportioning, and probably stuffing begging little beaks. I have seen the pair of adults side by side on two occasions. Like most other birds of prey, Northern Hawk Owls exhibit reverse sexual dimorphism, a biologist's fancy term for the fact that the females are larger than the males. This trait is less pronounced in Hawk Owls than in other owl species, but she is noticeably, if not appreciably larger. The most generally accepted explanation for reverse sexual dimorphism in raptors is that it establishes female dominance right at the beginning of pair formation, thereby decreasing the chances of aggressive behavior and competition for prey between mates. My corroborative evidence with this pair is that I have never seen the male go anywhere near the nest, though he certainly knows where it is. After dropping off prey for his mate, the male typically "hangs around" on a high snag overlooking the nest clearing for some minutes, emitting soft contact calls to the female as she prepares the meal. The order of business at mealtime seems taken straight from an airline flight attendant's safety spiel--secure your own oxygen mask (capture prey and consume it) first, then take care of the young ones. And for the same logical reason. If the adult becomes stressed or loses the capacity to function, the young have no chance to survive on their own. The nestlings I have seen cannot be more than a few days old. Though they seem to be walking around on top of one another and flexing their tiny wings, they are unsteady and quickly stumble and fall out of sight. They are still covered with dirty gray down and appear unable to even open their eyes yet. The female's behavior upon her arrival at the nest with food also indicates she is still in the early stages of brooding. Though she leaves the nest for up to half an hour at a time to hunt, when she returns she immediately mantles the cavity with outstretched wings, the owlets shielded beneath her as she prepares the meal and they eat. When the meal is finished her wings are drawn in and she sleeps as the male retreats to his undiscovered daytime roost. The nest is 30 feet up in a cavity at the top of a dead pine, originally killed by a long ago fire, then snapped off by rot or storm. From my vantage point at the edge of the clearing the nest appears smallish for a bird this size as the top of the snag did not break away evenly. The owlets will have a 270 degree view of their new world, but there is a "back wall" of about 90 degrees which rises up another foot or so. The female must position herself so that her long, hawk-like tail is not scrunched and bent against this extension of wood, so it seems she is always bumping her head against it or hunching her shoulders and twisting her neck to do her work in the back of the cavity. When she sleeps, though, she leans against it and appears quite comfortable. As with mothers of our own species, it seems the devil is in the details of day-to-day life. I have been privileged in my observations to have heard almost the entire gamut of Hawk Owl vocals, including the male's advertisement song even though courtship and nest site selection are over and I have not witnessed copulation. This species is, after all, Surnia ulula by scientific name, so I was delighted to hear one burst of ululations from the male after a food delivery. The most frequent thing I've heard is a soft "sheee-YIP" from the female, typically delivered when she first leaves the nest. The literature says this is a solicitation for food, but I have heard the male respond with what is, to my ears, the exact same call. I hear the faraway whistle of the next ore train. I feel that vague but familiar visceral loneliness. This is my third Hawk Owl encounter, all in distant places, the first two now distant memories. A small pond in eastern Alaska's Wrangell-St. Elias Wilderness. A burn near Churchill, Manitoba. 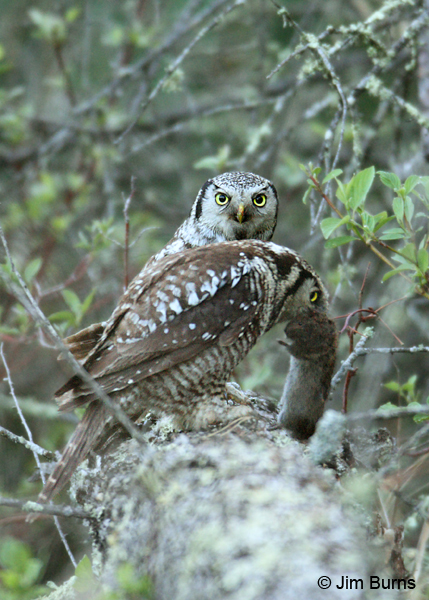 Northern Hawk Owls, though not rare, are usually amongst the last of the regularly occurring North American breeding species to grace a typical Life Llist. They breed northward to the southern limits of Snowy Owl territory in remote and mostly inaccessible wilderness. Breeding territories are quite large and, additionally, they are nomads, following seasonal cycles of surge and crash in preferred prey populations. Even in winters of irruptive years, they are found only in the frozen northern margins of the lower forty-eight. Because they are nomadic and because they are only seasonally monogamous, Northern Hawk Owls rarely reuse a nest site from one year to the next. This adds to the difficulty in finding and observing them, for laymen birders and scientific researchers alike, adds to the mystery of their daily lives, adds to the heightened mystique they enjoy in a family of birds well reputed for its difficulty, mystery and mystique. I know it is time to leave, but there is something in the genetic footprint of our species that makes us linger in wild places. And I know I cannot come back. The owls will not be here next season. Perhaps our youngest son, a professional river guide, has been right all along. We, he and I at least, have been born a century too late. Wilderness has changed, if not by definition, then at least by degree and accessibility, this Hawk Owl family within earshot of the ore trains somehow less representative of its species than the ones in Wrangell-St. Elias consorting with the grizzlies. And the ones farther north, in the trackless bush never encountered by human eye, somehow more representative still. Do those Hawk Owls, unbeheld by human eye and never within earshot of the shining rails even exist outside the unbeholder’s conjured vision? How long could dreamworks produce that vision without a proper reference point? Was the biologist with his charts and measuring tools the mad alchemist, or was it I with my dreams and lenses? And if that vision ever be lost, would not our own species have crossed over some irrevocable evolutionary frontier?